Now we are back in the cold grip of Winter Mr B and I are craving more and more slow-cooked hearty food. 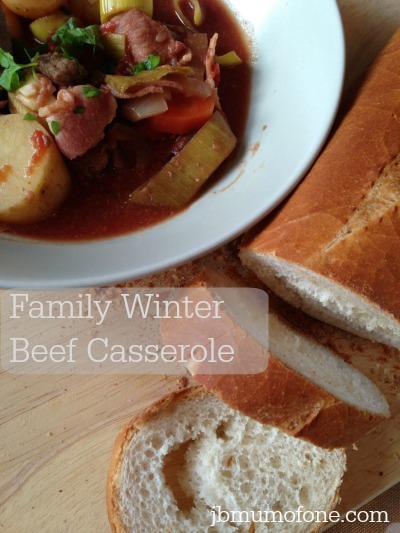 This family winter beef casserole is one of my favourites. Ir is really simple to make, freezes well, and the kids love it too. I find stews one of the easiest ways to get vegetables into the toddler who can be a little fussy at times. For me the key to this recipe is time, thyme, and thickly chopped carrots. I love how sweet and soft they get after several hours in the pot. If you do give this a go please let me know what you think below. A delicious and hearty beef casserole that the whole family will enjoy. Preheat the slow cooker if required. Coat the beef in lightly seasoned plain flour. Thickly chop the bacon rashers. Add the beef and bacon and cook gently for 4-5 minutes until browned. Remove with a slotted spoon and add to the slow cooker. Add the onion and garlic to the frying pan and fry gently for 2-3 minutes until softened but not browned. Add your remaining ingredients to the slow cooker and cook on low for 6-8 hours. We serve this in large bowls with some fresh crusty bread. If you don't have a slow cooker this can be easily adapted. Once your beef and bacon have browned in a large, flame-proof casserole dish remove and set aside. Fry onion and garlic as above. Then add the tomatoes and stock and bring to the boil. Add your remaining ingredients, return the beef to the dish and season to taste. Cover and cook for 3-4 hours until the beef is tender. Oh my Jenny! I am on a diet and today I am eating only veg and fruits! This looks so yummy and comforting! It was delicious! It is not too high calorie either. I guess cutting out the bacon may help a bit. Cant beat a good warming casserole on a cold day – I have perfected my veggie hotpot this winter, similar to yours – but with quorn steak strips and a layer of sliced potatoes on top! Sounds lovely…and I love a ‘hotpot’ topping on stews, mmmmmm. Sounds delicious, perfect winter warmer especially if you have been out all day. That’s what I really love about the slow cooker, that I can just leave it running, come home and it is all ready to go when we are. Hi Jenny.Thanks for linking up to Slow Cooker Sunday.Sorry for not being over sooner.I’ll be promoting your recipe today.